Chocolate is season-less food. It does not matter whether it is cold, hot, humid or dry outside, chocolate does not follow a calendar. With P. and I, it is on the menu at any time, any day of the month, as long as it is dark: eaten raw, this is how we like it. Yet, some of my friends still look surprised to hear that I crave one two pieces of chocolate a day in the middle of summer, taken preferably after lunch or as an afternoon snack, au goûter. “Ah non pas moi, il fait trop chaud pour manger du chocolat,” (Not for me, it is too hot to eat chocolate) I can hear them add when I offer some of the bar that I always secretly keep in my purse, in case of an emergency. For once, it does not matter if it is too hot, I just like it as much. And I should not be surprised. Chocolate has all of the beneficial nutrients that I, the runner and the girl-who-likes-to-always-walk-fast, crave. My body knows that it needs a good intake of potassium, magnesium and make-me-happy fuel. I am not teaching you anything. There have been many studies made on chocolate, some more assertive than others about all of its positive sides. The dark one with a high cocoa contents, of course, is the good chocolate, as is often noted. And I would tend to agree, but this is more a question of taste. Over the years, I have also learned to cook with and eat other types of chocolate, milk or white. And, even if I have tried 99% cocoa contents chocolate before (Michel Cluizel for example), I actually like mine best between 70 and 85%, depending on how much of a sweet tooth I have. Aside from eating chocolate by the piece, I am also very fond of making chocolate cakes. You probably know this by now. Since you were quite a few to have asked for the recipe of my Amaranth Chocolate Cake, of which I posted pictures when we traveled to Acadia National Park in Maine, I thought that I would bake it again, and give you its not-so-hidden secret. For this recipe, I was quite curious to experiment with two flours I have grown quite fond of for taste and nutritional values: quinoa and amaranth. 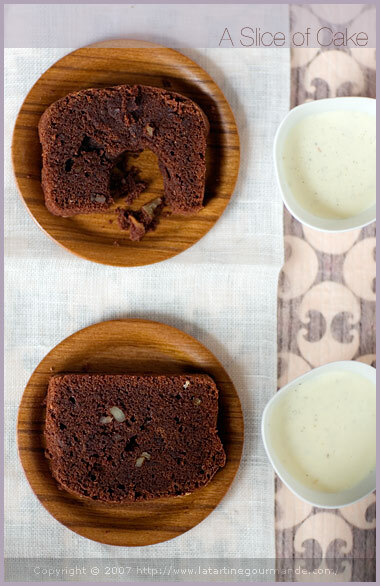 Adding them both to chocolate worked perfectly: they left the cake light, adding a grainier texture too. While amaranth flour adds protein and fiber — amaranth has three times more fiber than wheat, five times more iron, it contains calcium, iron, potassium, phosphorus, and vitamins A and C — quinoa flour gives a moist nutty texture to the cake, perfect combined with chopped pecans tossed in the batter. So perhaps you will have guessed that this cake has become a favorite. And then, why not stock up on those good nutrients while enjoying a nice piece of chocolate cake? Note also that because amaranth and quinoa flours are both gluten-free, this gives you a great gluten-free chocolate cake recipe, in case this matters in your diet. Me? For the curious ones, I am not gluten intolerant but currently somewhat gluten sensitive. And I must say, adapting and experimenting with different gluten-free baking products has been a pretty enriching experience, pushing me outside my comfort zone. I always thrive on that. As long as there is chocolate, or a piece of chocolate cake in my handbag. PS: The cake can be enjoyed as such. 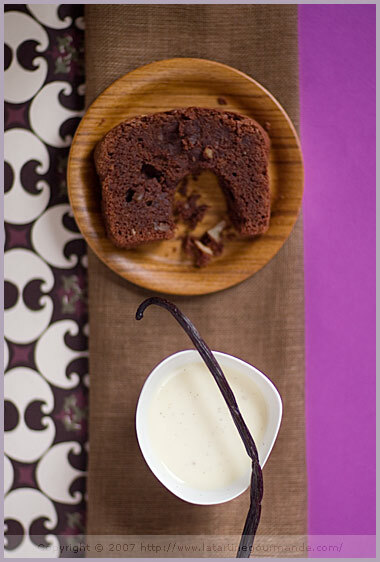 I also love to eat it with plain yogurt or a vanilla-flavored crème anglaise, as shown on the picture. Butter a 2 x 7 3/4 “rectangular mold and line it with parchment paper. Melt the chocolate with the butter in a double-boiler (or a bowl placed on top of a pot full of simmering water). Beat the yolks with the sugar and vanilla until light and white in color. Add the chocolate preparation and mix until well incorporated. Add the nuts and the flours, and mix well until smooth in texture. Add a pinch of salt to the whites and beat them until light and firm. Fold in the previous preparation, making sure that it stays light. Pour the batter in the mold and cook for 45 min or so. Check if the cake is cooked by inserting the blade of a knife. It should come out almost dry, but not totally (the cake is moist). Remove the cake and let cool slightly before unmolding. Let cool on a rack. Graissez un moule rectangulaire de 5 x 19,5 cm et placez une feuille de papier sulfurisé. Faites fondre le chocolat avec le beurre au bain marie, sans que le bol ne touche l’eau frémissante. Cassez les oeufs en séparant les jaunes des blancs. Battez les jaunes avec le sucre et la vanille, jusqu’à blanchiment. Ajoutez alors la préparation au chocolat et incorporez bien en lissant. Ajoutez les noix et la farine versée en pluie, et mélangez. Battez les blancs d’oeuf en neige ferme avec une pincée de sel. Incorporez-les délicatement, sans faire tomber la masse. Versez la préparation dans le moule et mettez au four pendant 45 min environ. Vérifiez la cuisson en enfonçant la lame d’un couteau qui doit ressortir presque sèche mais pas complètement. Le gâteau reste un peu humide car il est moelleux. Sortez le gâteau et laissez-le refroidir avant de le démouler. Laissez refroidir sur grille. What a beautiful chocolate cake! I’ll take a piece to stick in my purse as well! I relegate the bulk of my chocolatey baking to the January-to-April season. There’s not much going on in terms of seasonal fruits and spices, and I need the comfort of chocolate to get through the chilly days. That being said, I don’t consider baking with chocolate in July a sin (as I would baking with pumpkin in May or with peaches in January). Il a une texture du tonnerre ton gpateau. Bien que végétarienne, je ne connais pas l’amaranth, enfin j’ai dû en manger une ou deux fois dans un muesli. je me laisserais bien tenter par ta recette! Aii, not you too, Bea, this gluten business is serious. It’s lucky, yes, that you know now while you’re ‘sensitive’ and can adapt and learn and not make yourself worse (right?) and also prepare. And about the baking pan, it’s antique? Is the parchment required because of its finish? PS And for your commenter Caroline, that’s my seasonal rhythm too. Thsi one will be perfect for the husband! I had to epxeriment a lot with both these flours and I think he had given up on baked goods until I got a handle on things and now he’s a very happy guy! Thanks for sharing! Oh, and I too “need” chocolate, preferably after lunch with my coffee. I can eat chocolate any time too, although when it’s super hot I prefer it as ice cream, but I’d take dark chocolate squares too. This is great, une super recette pour les intolérants au gluten. I’m taking note of it as I’m trying to cut down on the gluten somewhat as well just as a test. i love it how you make gluten free things while not trying to make it gluten free. it makes gf baking seem much less surgical when its gluten free by chance. i love quinoa. you baking tin is quite cute also. Love the retro loaf pan! super le moule à gateau ! je suis comme toi : du chocolat toute l’année, mais l’été je le garde au frigo et c’est délicieux – bien que pas “acceptable” par les puristes !!! I love the photos today! i love quinoa but never have qunioa flour…i agree with the chocolate though when baking does not call it fantastic for hot chocolate milk…. 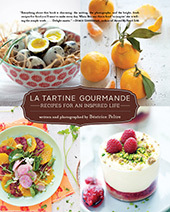 By the way, I nominated you to “Inspiring Food Photography” event that I’m hosting on my blog. I agree that chocolate has no season! This cake looks delicious and I love the pan that you baked it in too. Wow, interesting. I too am somewhat sensitive to wheat. I have never seen amaranth or quinoa in the form of flour, but I will certainly look for them. Chocolate is deifnitely a year-round necessity in our house. The cakes looks beautiful — I might be a bit influenced by that lovely cake pan. I found the same one at a yard sale many years ago and it’s been one of my favorite pans ever since! Great, I needed a recipe for the amaranth and quinoa flours I bought a while ago … and a chocolate cake seems just perfect ! Thanks !!! Je rentre bientot en Alsace … Melbourne va me manquer! 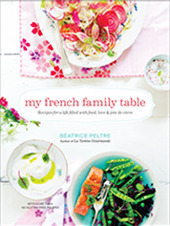 je ne suis toujours pas allée au “books for cooks” mais c’est dangereusement (pour les baggages …) sur ma liste des choses à ne pas louper ! As tu d’ autres suggestions de choses a faire/voir avant le grand départ ? Bea, I finally had a bit of time on my hands today to go back to your archives, to when you first started blogging. I have to tell you: your photography skills have improved ten fold. I can’t even believe it is the same person today, to the person who started taking those pictures so long ago. Well done, girl. You’ve learned a lot and you keep getting better. I’m so happy for you. Keep taking photo’s and cooking up a storm and soon you’ll conquer the world. You have the most gorgeous baking pans and plates and everything else! And yes, one can never have enough chocolate! J’adore le moule et les 2 premières photos sont trop trop sympas !! Quel mariage original amarante et quinoa, encore une recette à mettre sur la pile ! avec du guanaja donc !! j’ai ça dans mes placards pas de problème j’ai même les farines que tu utilises c’est tout dire !!! Un bon vieux moule comme celui-ci ne peut donner qu’un excellent gâteau… des associations de farines qui me sont inconnues mais qui laissent présager de belles saveurs… j’en prendrais bien une belle tranche… pour mon petit déjeuner ! The recipe sounds great Bea – I am following your recent flour experimentations with great interest! When I was studying I did big project on chocolate, which incidentally involved a days chocolate tasting (who’d have thought it – there is such a thing as too much chocolate!). An interesting thing I found out is that chocolate is blended differently for different countries so that it does not melt in warmer climates (though sadly this also makes it less ‘melt in your mouth’). So you are obviously right and your friends are wrong – we are intended to eat chocolate whatever the weather! ça ne va pas du tout j’ai de la farine de quinoa mais pas d’amaranthe…en tout cas il est superbe ! What a great alternative to traditional chocolate cake! It looks so moist! I think you are so right, Béa! Too often people think chocolate and assume that it’s the sugary stuff sold in plastic wrappers at the store. But real chocolate is so beautiful and so good for you. Now on to the amaranth … I’ve wanted to try this ingredient for a long time but haven’t. You’ve inspired me! Another new ingredient for me to try! Lovely cake bea! Je serais curieuse de goûter cette variante de cake avec ces farines originales! I have a question, do you set up lights in your kitchen? or do you have a studio set up? What an interesting chocolate cake recipe Bea. More and more people are asking for gluten free cakes at La Cocotte. I’ve marked this for one to do. Eternel chocolat quel que soit le temps, le calendrier ou l’heure… Une nouvelle et exquise tentation que tu nous proposes là ! Am I blind? Suis-je aveugle? I can’t find your recipe for quinoa/amaranth chocolate cake? Only photos and discussion about it! My all-time favorite chocolate cupcake recipe uses quinoa flour – the texture is amazing, and it makes it seem way richer than the recipe really is. Your cake is beautiful! I will definitely be trying it! Mostly I’m savory but there are those times when only the chocolate will do. I must do some exploring with these two flours. Béa, what most moves me with these photos is the loaf pan. It just speaks history. Thank you all for your comments. I truly encourage you to try the flours! I have a load of ideas and projects on how to use them. Already made many more things, cannot keep up with the writing though. A few answers also, excuse the shorter comment here. Coffee and vanilla, thank you. Very kind of you! Elise, no studio setup here. Just natural light, as a matter of fact. Rachel, I should come and visit La Cocotte. What a lovely concept! And like many of you mentioned it as well, oh yes, I also love this pan. I would use it all the time if I could. It is rather on the smaller side compared to newer ones, but it is all for the best if like me, you believe that small means cute! That looks absolutely scrumptious! I’d love to try it, but haven’t been able to find quinoa or amaranth flour — could I substitute them with something else? Thanks for your visit. If you cannot find quinoa or amaranth, use all-purpose. I hope you like it. Both flours are available at Arrowhead Mills and Bob’s Red Mill. Arrowhead sells by mail. Not sure about Bob’s. Check their websites. The recipe sounds wonderful…can’t ever have too much cake! (specially chocolate) The pan- I love it…looks like an oldie, very charming. Je voudrais savoir si tu as déjà fait des expériences avec la farine de kamut. Je n’ai pas de farine de quinoa mais j’aimerais essayer cette recette sans gluten. Qu’en penses tu? Le kamut contient en fait du gluten, meme si pas autant que pour une farine de ble classique. D’autres farines sans gluten seraient bien sur riz, millet ou sorghum. Pingback: SaltShaker » Blog Archive » Happy 5516! Thanks for sharing this wonderful article with some great stuff.Good dark chocolate can help you lose weight, help thin you blood, improve your mood and can actually address ant-aging and has a number of other significant health benefits. I made this and it is sensational! I doubled the recipe and made it in a regular sized loaf pan. I went lighter on the sugar because I wanted it as a breakfast cake. It is so rich!! I LOVE it! It really features the flours. So many recipes using alternative flours treat them as substitutes, but this one celebrates their qualities. I will be making this often. Thank you, Bea! Wow – looks absolutely delightful, and certainly much healthier than brownies. I’ll have to try it this weekend with some cinnamon (perhaps a touch of chile?) for a Mayan chocolate treat! Hello, I was looking for recipes featuring amaranth and just discovered your site (congrats, by the way, it looks amazing!). About your recipe, does this work with quinoa and amaranth grains instead of flour? Or maybe to substitute the quinoa flour with normal flour and use amaranth grains? I would like to make this recipe, but we only have regular size loaf pans (it seems there are many different sizes)…I know someone mentioned that they just doubled the recipe…Does anyone else have any feedback on using a larger loaf pan?? I have a 4×12 inch loaf pan and I was wondering whether I should double the recipe? That’s a good idea. Try and let me know…. Hi Bea, wonderful cake! I have a question — is the baking pan really only 2 inches wide? The one in the picture seems wider.. thanks! 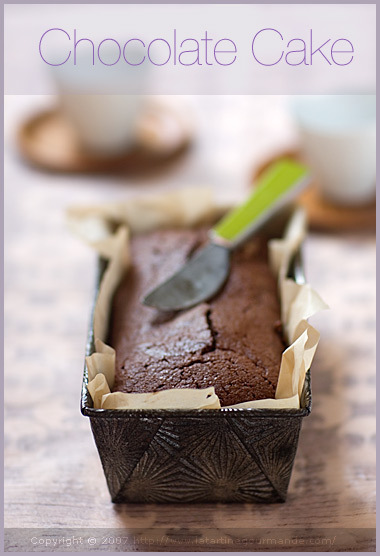 This is the best gluten free chocolate loaf cake I have ever had! It is delicious!! I lightened it up a little with only 3 T butter, 2 T grapseeed oil and 1 T almond oil. I also substituted one flaxseed “egg”(treated like a yolk) so that I only used 2 eggs and it was SCRUMPTIOUS! Don’t bother to veganize completely. I did and the result was like a chewy brownie which was edible but did not evoke sighs of complete contentment. I am going to bake this cake again with my original modifications since I did not miss any of the extra saturated fat at all. Thank you so much! This is a delicious recipe. It’s difficult to get such a nice texture with GF ingredients, but this is perfect! A few observations: I would suggest seperating the eggs into 2 large mixing bowls and beating the whites first with a hand mixer (so you don’t have to wash the beaters before you do the yolks). I used a regular glass loaf pan and it worked well. I’d imagine you could double this and use 2 circular cake pans for a layered cake. I had an idea to replace the chocolate with canned pumpkin (to make it super-healthy). It turned out OK, but “deflated” on top and was a little too moist (doubled the recipe, used 3/4 C canola oil instead of butter, 1/2 C of each flour, 1 C sugar, 1 can pumpkin). If you want to perfect that recipe, I’d love to see it here! Amazing recipe! Can’t wait to try it. But, this is going to sound very weird, but I actually don’t like chocolate and my hubby can’t have it anymore because it’s the only food that triggers the pain of gallstones…. So… What would be your recommendation for another flavor and in what quantities?? I assume it will depend if it’s moist or to right? Ike orange juice or zest or cranberries? Vanilla? 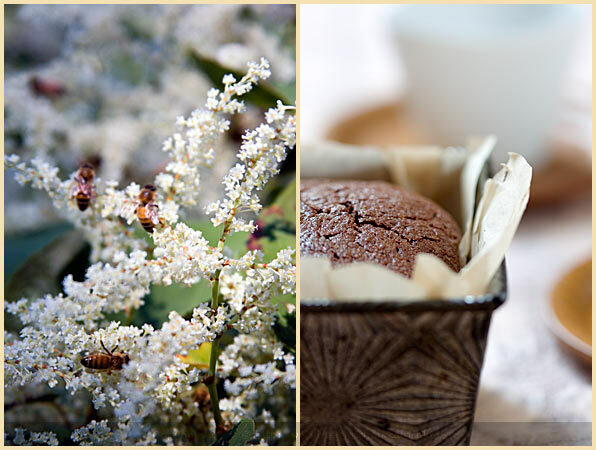 I love amaranth and quinoa and I’m always looking for new ways to eat them!! I’m not much of a cook, but I find it hard to believe that you can get a loaf that size with only 6 tablespoons of flour (quinoa & amaranth combined). There are more liquids (butter & eggs) than solids – and that doesn’t count melted chocolate. Has anyone actually made (or even read) this recipe? I’ve made it numerous times and many readers have baked it too. 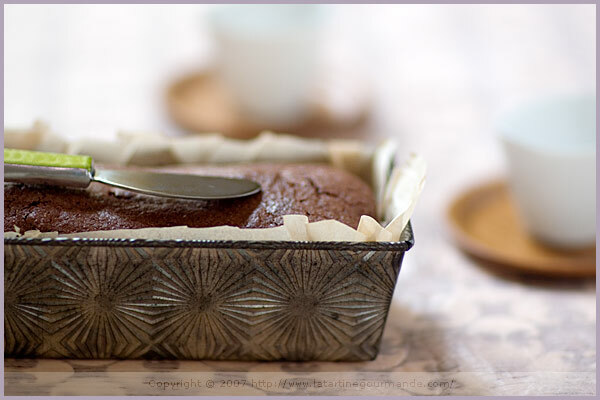 The cake mold is small, and to make a chocolate cake, you don’t necessarily need a lot of flour. I couldn’t find quinoa where i live in Germany, but i substituted millet flour and it worked out well. The millet flour seems kind of nutty as well, so this cd be a good substitute. Oh, I also added one Tbsp cornstarch. I’ll be definitely making it again, and this time I’ll make the whole batch in a loaf tin. It’s well worth it! Hello, has anyone ever tried baking the cake with xylitol? I am on a sugar detox, so raw cane sugar is not an option. However, I have heard dire warnings about baking with xylitol….any experiences? Hi, looks delicious though I am also dairy free, may I use coconut oil instead of the butter? I saved This Lovely Recipe some time ago and while ordering Chocolate online, I saw some that was 80% and I Remembered… I MUST MAKE THAT CAKE! Did you know that THE 👑QUEEN Is Pretty Much Addicted To Chocolate Cake? Her Chef bakes them constantly, and it is said that She Always Carries A Slice In Her Purse! Now That’s Being Prepared. I think Chocolate should have Its Own Food Group. You certainly receive some Strange Comments… I mean, Worse Than Mine! “…replace the chocolate with pumpkin…” WHAT?!? !